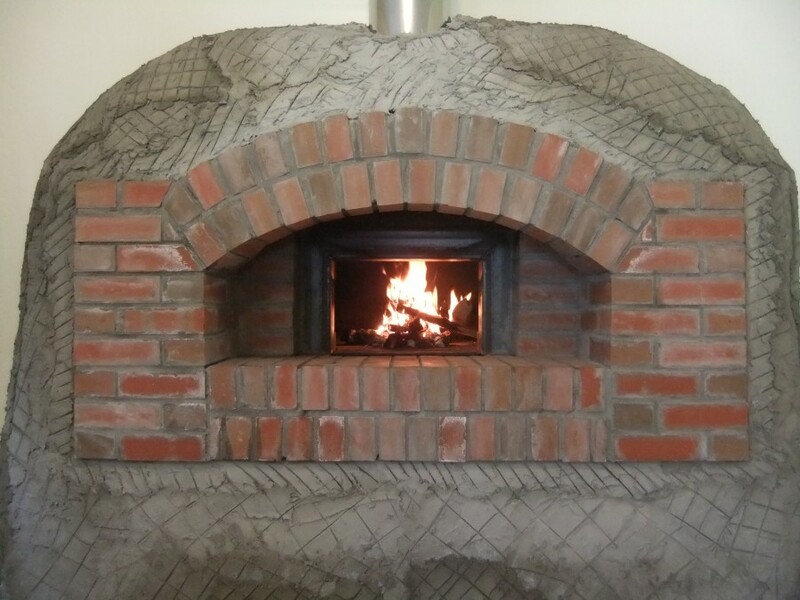 So, this is the first few days of this week, curing the concrete and insulating the oven. 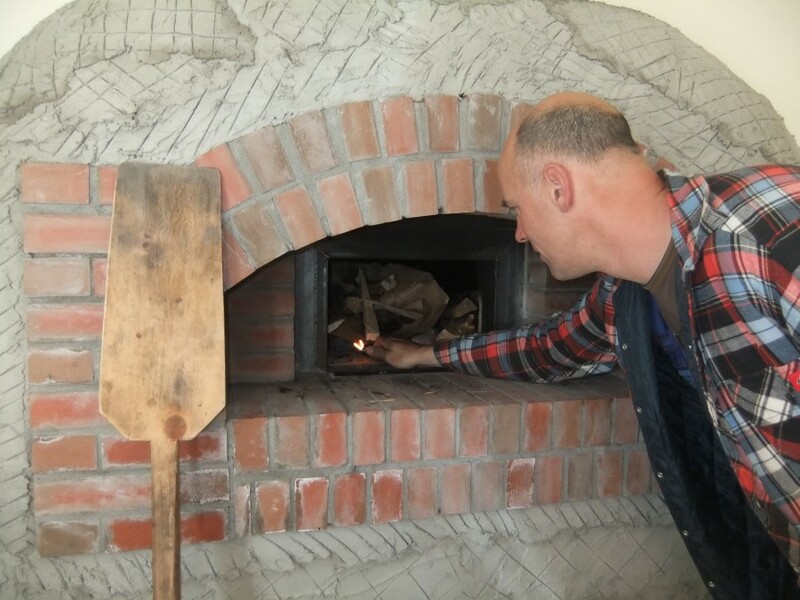 Tim lighting the first small concrete-curing fire. 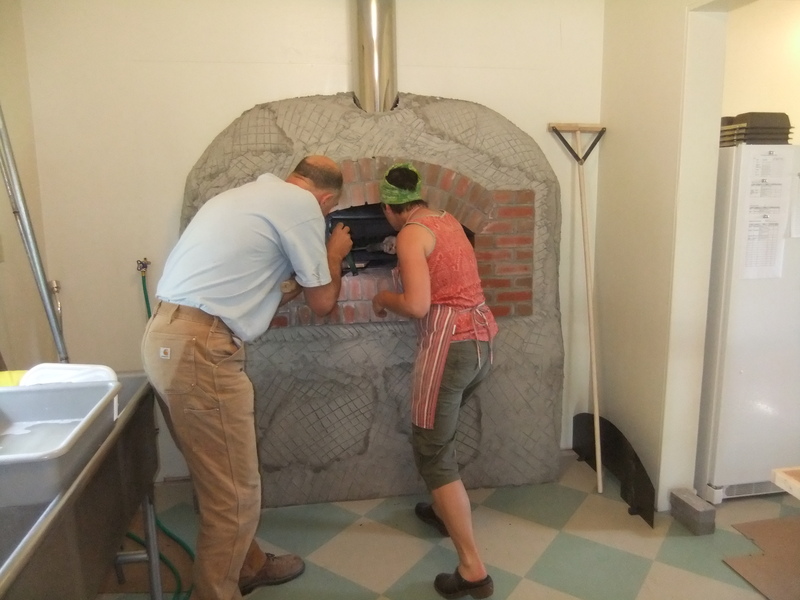 The first small fire in the oven, blazing away, helping to dry everything out properly before we put insulation over the oven body. The scratch coat of stucco is done as well, and needs to cure before the smooth coat(s) go on. 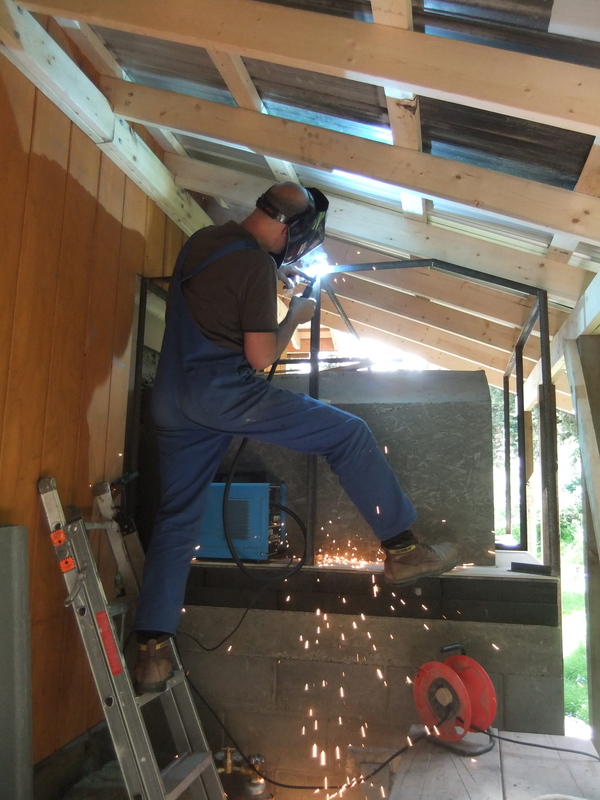 Tim welding the frame which will encase the oven’s insulation. Is there anything that guy cannot do? The oven getting its insulating jackets put on: first a couple layers of ceramic fibre blanket and then rock wool insulation. 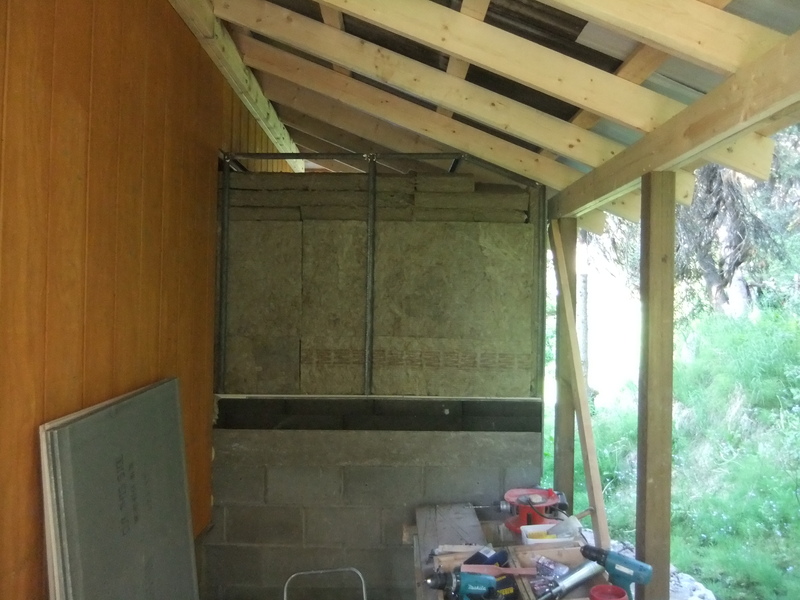 The insulation complete – now there is just the work to encase the insulation in cement backer board. 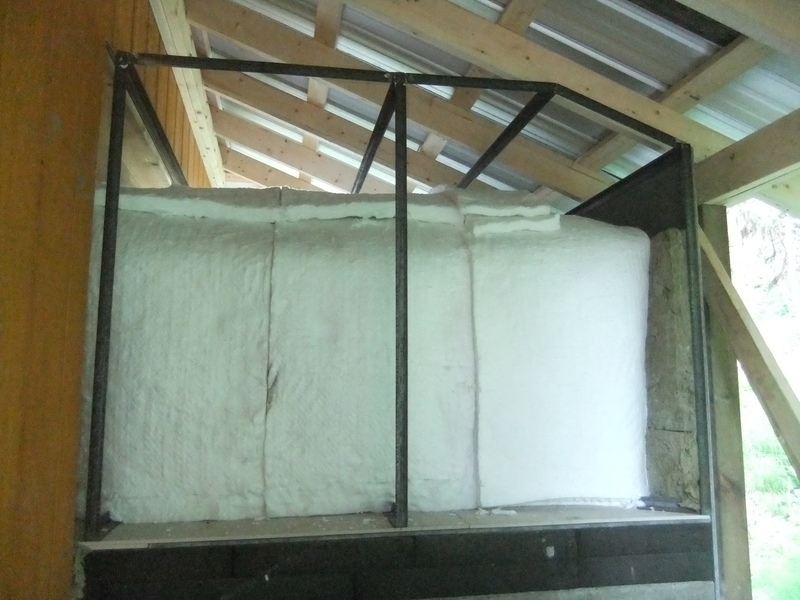 And while the concrete was curing we were busy making things we will need before we go into production. 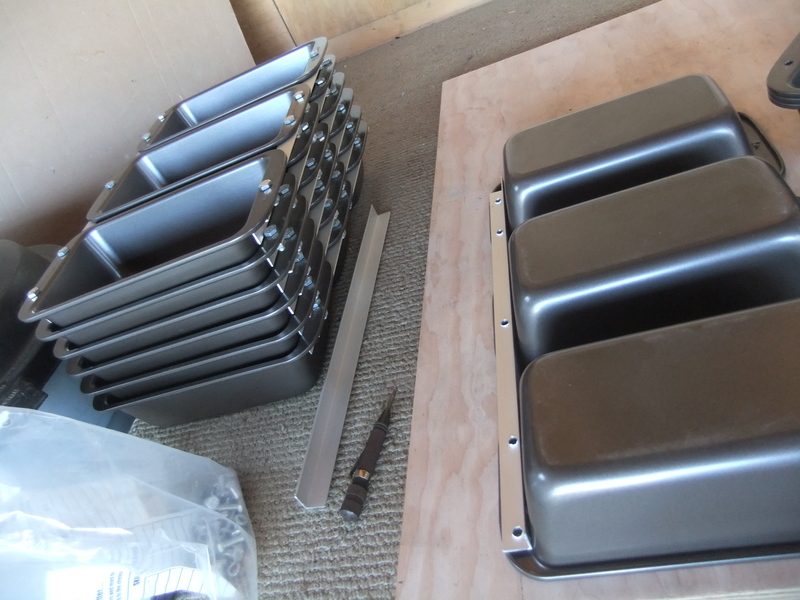 Making bread pans that are custom-sized to go in the oven. These multi-loaf pans are expensive to buy, and this was yet another great idea I learned from Roman and Monika at Red Rooster Bakery. We got a great deal on aluminium at Princess Auto – they were so confused about the way Tim says the word they only charged us for one piece! Various oven tools Tim has fashioned out of bits and pieces. 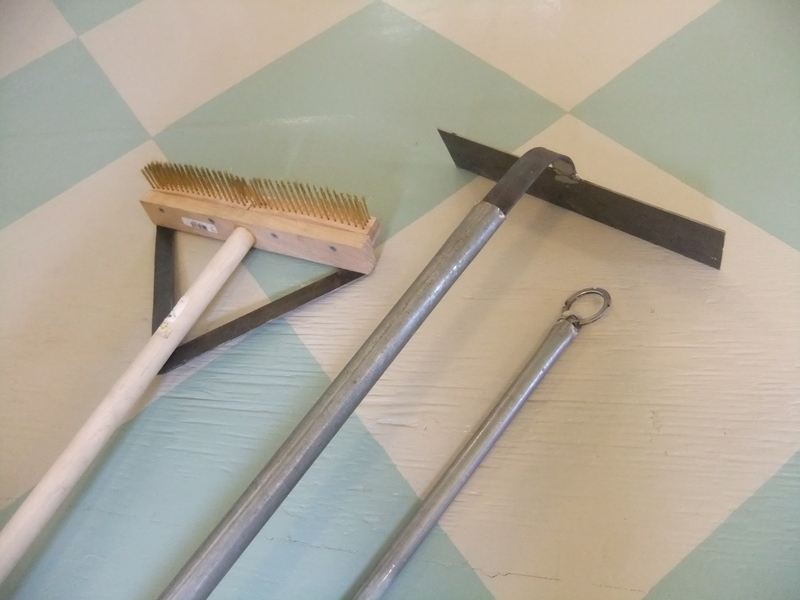 From left to right: a brass-bristle brush to clean the hearth, a scraper to remove the ashes, and a ring in which to put a damp towel to wipe the hearth before the bread goes in. All these things have very long handles, of course. Now the real test: actually making food that should be somewhat edible. 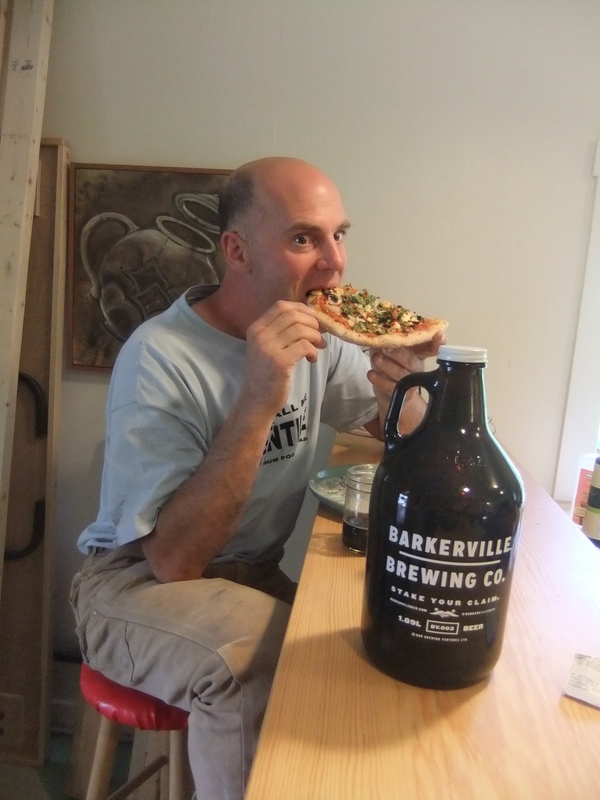 We had to have some pizza with the first bake day, it just wouldn’t have been right not to. What are we doing in there? Tim is holding the door open for me because I am using a very short-handled pizza peel – our new peels are on their way from a wood craftsman in Nova Scotia, via my parents! The first spoils from the oven! Nice shirt, Tim. Tasting the spoils. So far, Tim hasn’t keeled over, so I guess everything is OK.
Next the bread goes in. 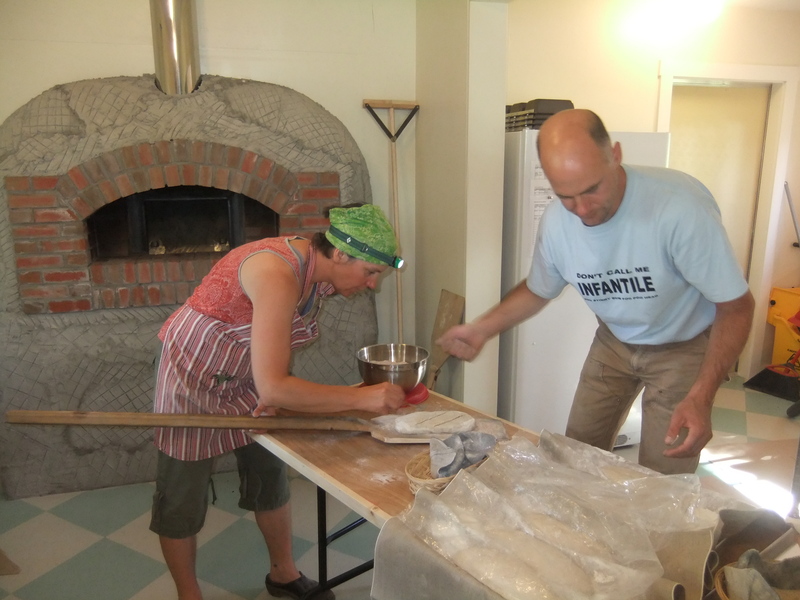 Team work: Tim loads the loaves on the peel, then I score them and put them into the oven. Not yet the smoothly oiled machine it will soon become. 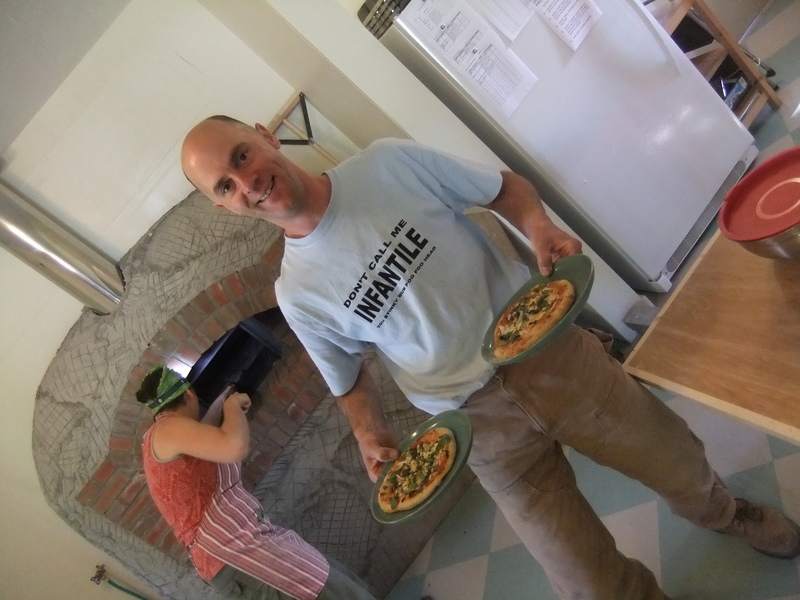 Notice my head lamp – I “rewired” the light for shining into the oven last week, and now it no longer works. Hmph. Measuring the temperature of the loaves to see if they are done. 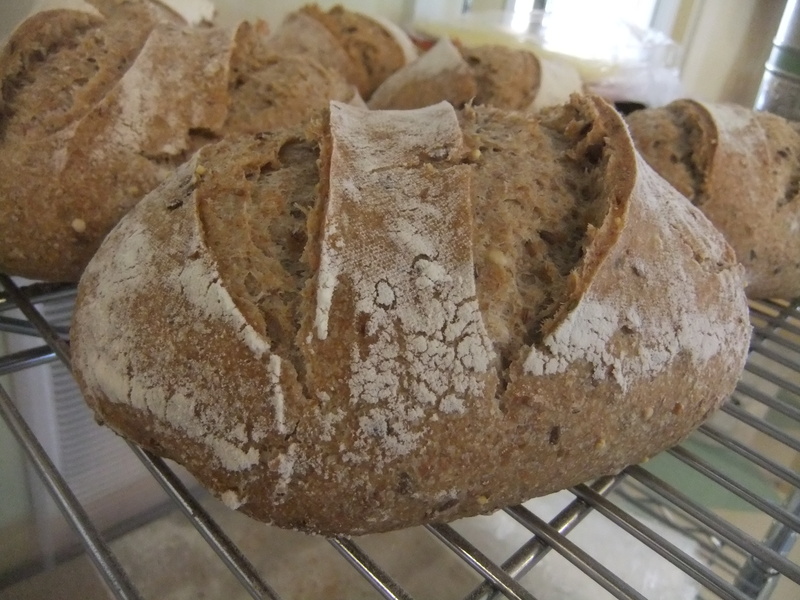 These first loads of bread didn’t brown nor cook well because the oven wan’t hot enough – better luck next time! 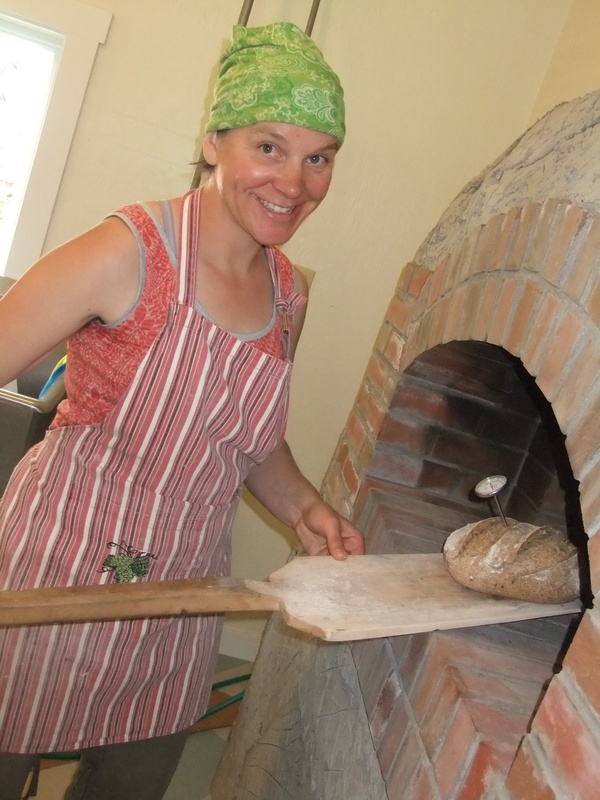 Still a big smile, it is VERY exciting to take bread out of the oven for the first time. Ryed On! (65% rye) rising in a proofing basket, just before going into the oven. 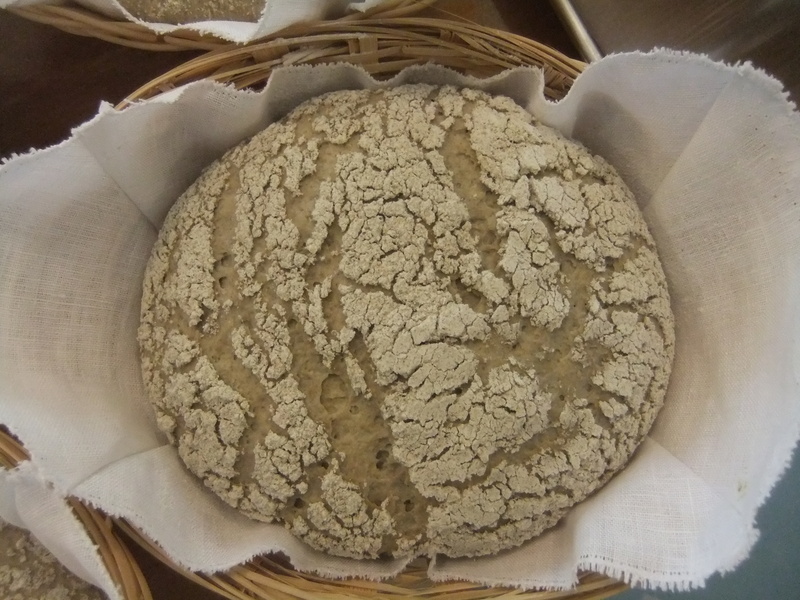 Grainy Day bread – nice score marks, but lacking volume and colour. It will get better, folks. Holey Hannah (modified Pain au Levain) broken open just to ensure there really are holes. I was pleased with how this bread turned out. I think/hope it will sell well. Oh yeah, there are holes AND it tastes pretty good, too. 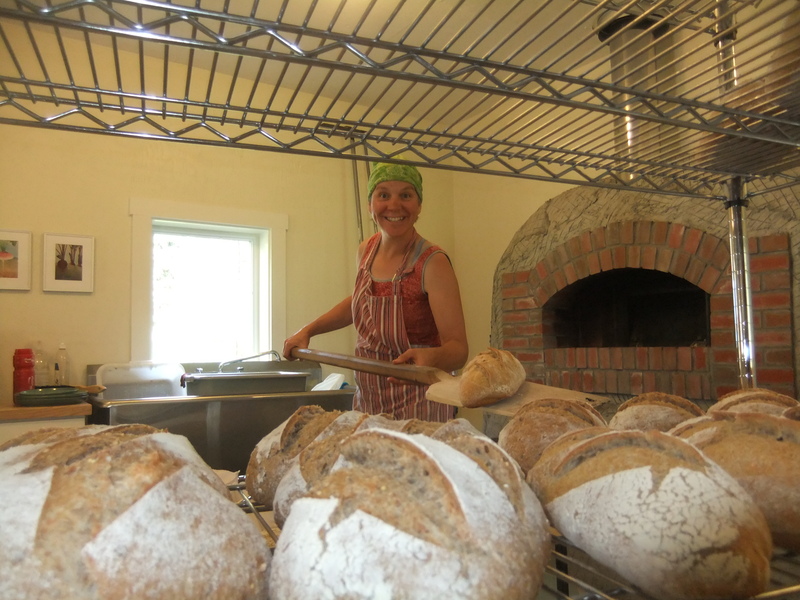 Today we are re-grouping and getting ready to bake for the first big public test: The Wells Farmer’s Market, Sunday July 13, from 9 am to 1 pm at the red-roofed gazebo where the highway crosses the Willow River. Be there to support the inaugural market! The markets will be every second Sunday through July, August and September. Great to see big smiles on your faces – you’re there! 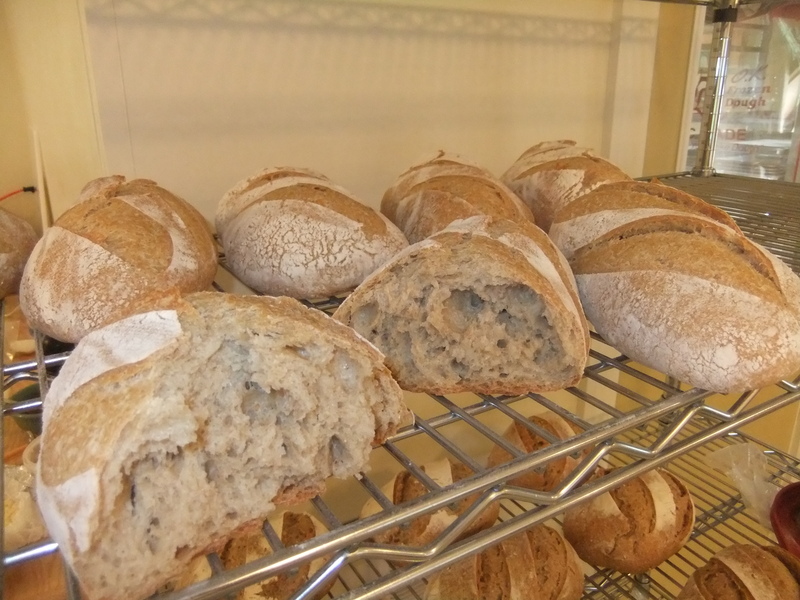 Nice looking breads (and pizze, too) – good luck at the Market. I am so excited for you! And looking forward to trying some……Great blog and photos! Congratulations Kate and Tim. Bread looks absolutely awesome and so attractively displayed. I can taste that good bread way out here in Nova Scotia and it’s YUMMY! And hey the two bread peddlers look pretty darn good themselves – looking especially happy and so they should be with the start of their successful venture.